Gas-powered pressure washers deliver about double the cleaning power of electric models. So if you grapple with a to-do list of patio mildew, peeling siding and other medium-duty cleaning tasks, a gas-powered washer could be worth your investment. Compared to their electric cousins, gas-driven washers do require that you educate yourself about the two types of oil required to keep everything running smoothly. 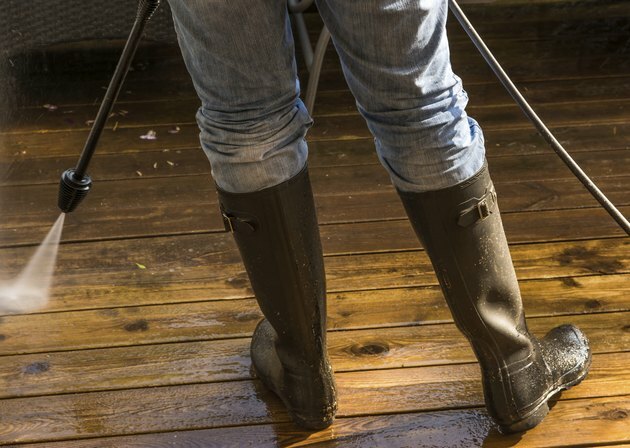 A dingy patio can perk up with a pressure wash. In operating conditions of 40 degrees Fahrenheit and higher, all-purpose SAE30 motor oil should work for your engine. This can be your go-to oil in temperate areas. On days when you're working in zero to 40 degrees, switch to 10W-30 oil for better starting. The 10W-30 oil may increase your oil consumption at 80 degrees and higher, though, notes Briggs & Stratton. If you want the best protection in all temperatures, as well as improved starting and lower oil consumption, Briggs & Stratton recommends springing for synthetic 5W-30 oil, rated for minus 20 degrees to 120 degrees. For best results in steady winter use, go for 5W-30. Regardless of viscosity, pick a detergent oil rated for service SF, SG, SH or SJ or higher, and avoid additives. The washer's water pump works best with DP70 pump oil. If that's not available, in a pinch, you can substitute 30W nondetergent oil. What Kind of Oil Do You Use in a Troy-Bilt 5550 Generator? What Kind of Oil Does a Troy-Bilt Tiller Use? What Kind of Oil Do I Put in My Ariens Lawn Mower?